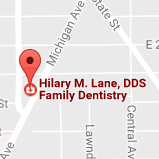 Hilary M. Lane, DDS - Family Dentistry is committed to providing exceptional dental care in a comfortable environment to patients who live or work in the Holland area. We are dedicated to providing the highest quality of dental care by focusing on prevention, patient comfort, education, and personalized treatment to children, adolescents, and adults. In a professional and friendly environment, we strive to help patients obtain a lifetime of optimal dental health. Our mission is to provide our patients with a gentle, anxiety-free experience. Dr. Hilary M. Lane spends time with her patients, making sure they receive a treatment plan tailored to their unique goals and healthcare needs. New patients are welcome to our Holland dental office, which serves patients from Zeeland, Saugatuck, and surrounding areas! Call us today to schedule an appointment.